​My original sculpture is worked in a mixture of three waxes of different consistencies. The shape is built up gradually by adding on, in order to obtain the three dimensional aspects of the piece. When I am satisfied with the piece, it goes to the foundry where they take a mould from my original. ​The work is cast by the lost wax method, which has been around for centuries. Each piece has a wax copy taken from the mould, which is then encased in a ceramic shell. Molten bronze is poured in and the wax melts out through risers. Once the bronze has cooled the ceramic shell is removed and any imperfections are removed. 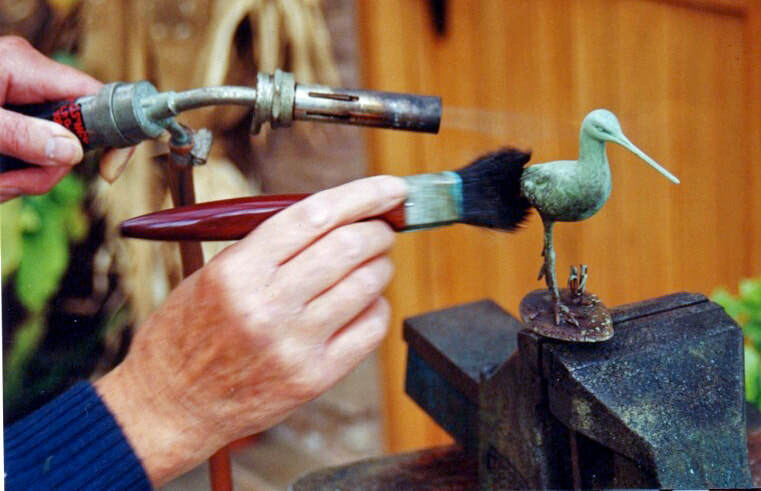 ​Due to the fineness of the beaks and legs, my sculptures have to be cast in several pieces and then welded together at the foundry. I collect them at this stage, and work on any part that needs fining down, then I apply the finishing patina, heating the bronze with a blowtorch in order to evaporate the water from the chemical solutions as they are applied with a brush, thus building up the patina. I use a copper solution to give the green colour, iron for brown and potassium for black. I then apply a pure wax polish to seal the patina and when cold, buff it up to give depth to the patina. ​Bronze is an alloy containing approximately 85% copper with some tin, zinc and lead. It will survive almost anything and has the strength to allow me to produce work with fine legs, etc. which other materials would not. It can usually be repaired should an accident occur, without any evidence of a repair having taken place.